Remember the nausea and related problems that contributed to my medical leave of absence in February? Turns out it wasn’t the flu, an IBS flare-up, or even another kidney stone. As my symptoms continued and even became more severe I started seeking some answers and thus some help. My gastroentestinologist did a few tests including an EGD which showed a slight hiatal hernia, but that didn’t explain all my symptoms, even in combination with Irritable Bowel Syndrome. The next step was to have an abdominal ultrasound followed by an imaging study to track the function of the gallbladder. This showed that my gallbladder was functioning well below normal in spite of the fact that I had no stones (the most common cause of gallbladder problems in my age/gender category). I have once again proved to be unique by getting chronic acalculus cholecystitis, with typically occurs in men in their 40’s to 60’s, or patients with severe burns, in a coma, or on long-term IV nutrition – none of which apply to me! There aren’t really any management techniques that work for this, so the only treatment option is to remove the gallbladder. Surgery is scary to everyone, but as someone who lives with chronic pain that could potentially spread with even a minor injury, surgery is potentially life-changing. I learned long ago that worry and fear do nothing to benefit me and only adds to stress and anxiety which causes pain flares, which turns into a vicious cycle when the increased pain seems to confirm the pain is getting worse or spreading. I wrote a post about this back when my foot problems began, but I have continued to recognize the importance of trusting God with my future regardless of my fears. The only way out of this vicious cycle is to break it at one of the points so it doesn’t spiral out of control. 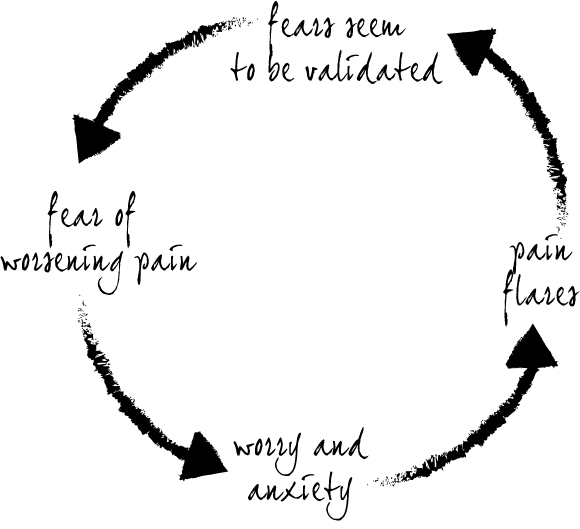 For me, the best place to break the cycle is when the fear first begins, before it becomes an anxiety or worry. I recognize that my worry simply cannot help the situation; if anything, it has the potential to make things worse. So at that point, I accept that what is going to happen is going to happen, regardless of how much or little I worry. Then I choose to allow God to be in control, and trust His wisdom is greater than mine. When I start to worry, I know I can relax because he is in control. For those as curious as me – a picture of my gallbladder through the laprascope prior to removal. There is actually no visible blood (except in bloodvessels) and isn’t really gory at all. Click here to see! I want a picture of my gall bladder…which will probably look terrible since it is full of stones! Really glad that surgery went well for you.